Ok I am being silly but it got your attention and “No” you can’t compete in your high heels. Several people have been asking what is needed to get started with Horse Agility. All that you need is a Halter, lead rope (at least 10′ long), proper footwear and a few simple obstacles. Protective boots where necessary are allowed for your horse. No whips, or sticks are allowed in the competition. If you want to compete in the International competition you will need to join “The Horse Agility Club” by visiting their website. As a member you will receive a handbook, membership card and two free entries into the competition. If you have more than 2 entries it will cost you an additional $7.00 (USA) for another entry. Every month you can compete with two horses if you so desire. Membership enables you to compete Internationally and you can attend playdays or local competitions that are affiliated with The Horse Agility club. There is also a Junior membership which is for anyone under 16 years old. Competitors under 7 years old must be accompanied by an adult in the competition. The child must be in sole charge of the horse unless the judge or adult feels like there is a safety issue. Children under 4 years of age may not compete. All equine must be at least 2 years old to compete, there is no upper age limit. Horses under 3 years of age can not compete above the Medium level. 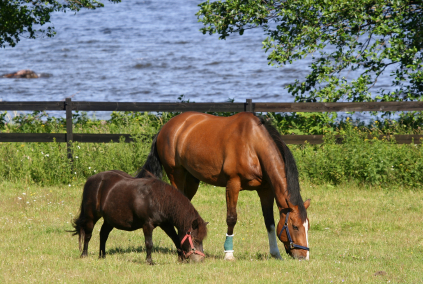 There are three height categories: Small Pony (up to 10.2hh), Pony (10.2hh to 14.2hh), Horse (14.2hh and up). However if class entries are less than three competitors classes may be combined. There are five levels of competition from Starter to Wild Agility. The first two levels are easy and designed to instill confidence. The third level is Medium which is harder, you are still online (halter and lead on) with your horse but now it is against the clock and you are being judged on horsemanship also. I will go more into depth of the levels in another post. Points are kept on the horse and they must accumulate twelve points to move up to the next level. Points are as follows: First – 5 points, Second – 3 points and Third – 1 point. The points are entered into the Horse Agility League for prizes at the end of the season. There are 10 obstacles in the course and out of the ten at least eight must be from the list in the handbook. The obstacles are laid out in an enclosed arena with the exception of Wild Agility. To get started you will need the following objects: poles, barrels, cones, tarp, two hula hoops, gate (any gate can even be a rope gate), curtain, jump any design (only 12” high), flag (make your own), and sacks to carry over horses back. I will go into more detail in another blog post about ideas for obstacles and how to build them. I offer online classes in Horse Agility or you can take lessons at my facility or yours. Call 325-261-3360 or email me today to setup your lesson. Have questions about the online course let me know.